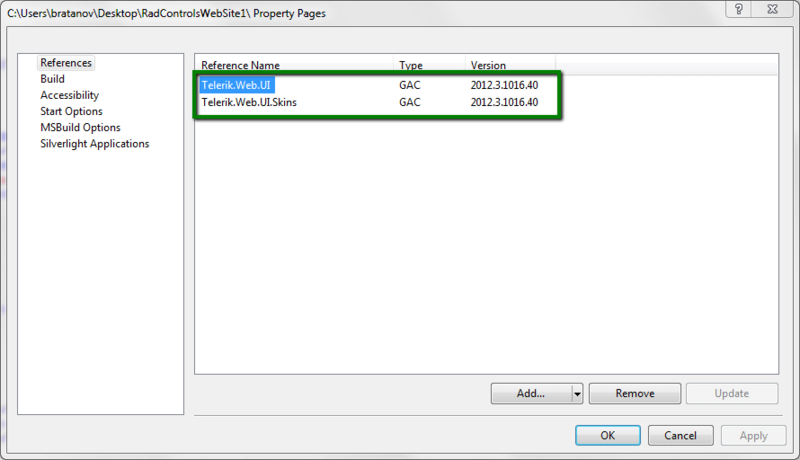 This article explains the basics on using the Global Assembly Cache (GAC) with the Telerik Controls. 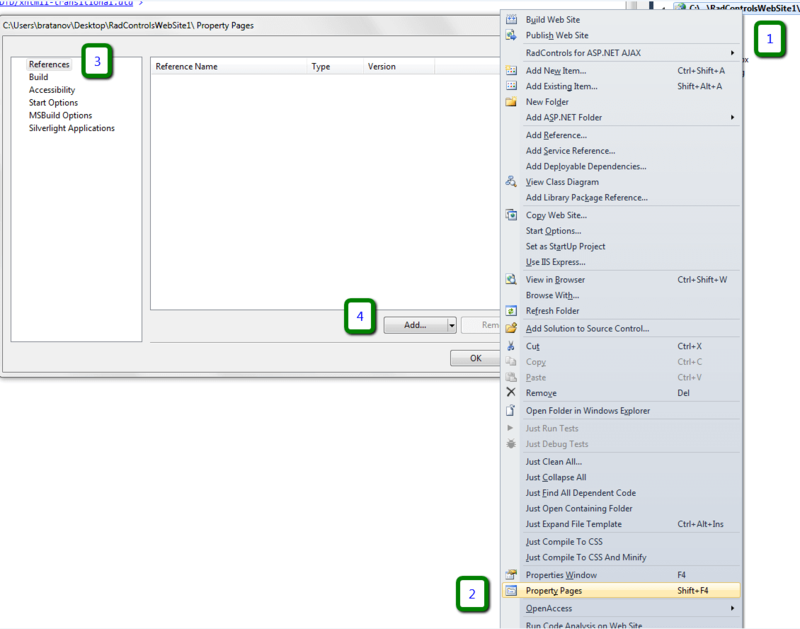 The Telerik® UI for ASP.NET AJAX assemblies are standard .NET assemblies, so all generic rules apply to them as well. We advise is that you reference all Telerik.Web. 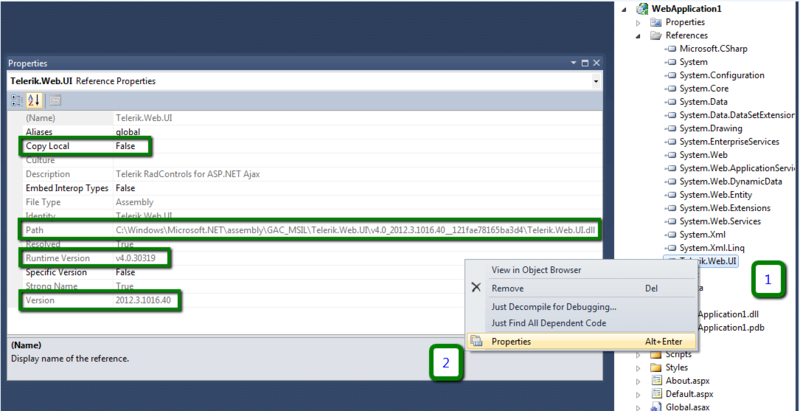 * assemblies (including Telerik.Web.Design.dll) from the BIN folder of your project. GAC is the short version of "Global Assembly Cache". It is a common place in the OS where assemblies that are going to be shared between different applications can be stored. The .NET assemblies are there, for example. Since .NET 4.0 it is in C:\Windows\Microsoft.Net\Assembly\GAC_MSIL\ and also the shell integration was removed, so you can no longer drag-and-drop an assembly in the folder and have it registered. 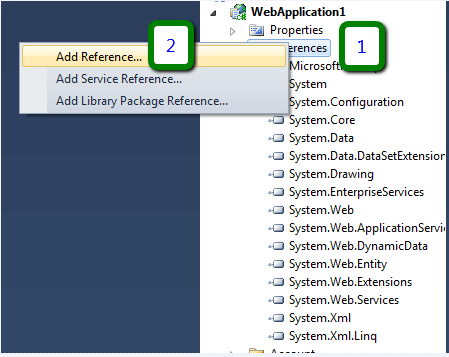 Assemblies are shared between all applications on the machine, which is excellent for SharePoint. Versioning is easy because the GAC can hold multiple versions of the same dll without issues. A local copy in the Bin folder of the application is not needed, so you can shave off a few megabytes on the hard drive of your server. The assemblies need to be added explicitly to the GAC when the application is deployed, a simple copy-paste no longer suffices. Microsoft recommend that you do not use the GAC, but keep relevant assemblies in the Bin. To put an assembly in the GAC it has to be signed. Usually, elevated user privileges will be needed to modify the GAC. The GAC runs under full trust, while the Bin of a concrete application can be under Medium trust, depending on the environment. First, you are going to need a tool from the .NET SDK that comes with Visual Studio – gacutil.exe. To run it go to -> All Programs -> Visual Studio -> Visual Studio Tools -> run the Visual Studio Command Prompt (or Developer Command prompt), depending on the VS version you use. gacutil /i "C:\Program Files\Progress\UI for ASP.NET AJAX R3 2017\Bin45\Telerik.Web.UI.dll"
There are other ways to add an assembly to the GAC (Windows offers a shell integration for .NET 3.5 so you can just drag-and-drop it; and the Windows Installer) but since the gacutil tool is available for standalone download without Visual Studio, it is the more general way that works on all .NET versions. Note that Microsoft do not recommend using gacutil in production environment. 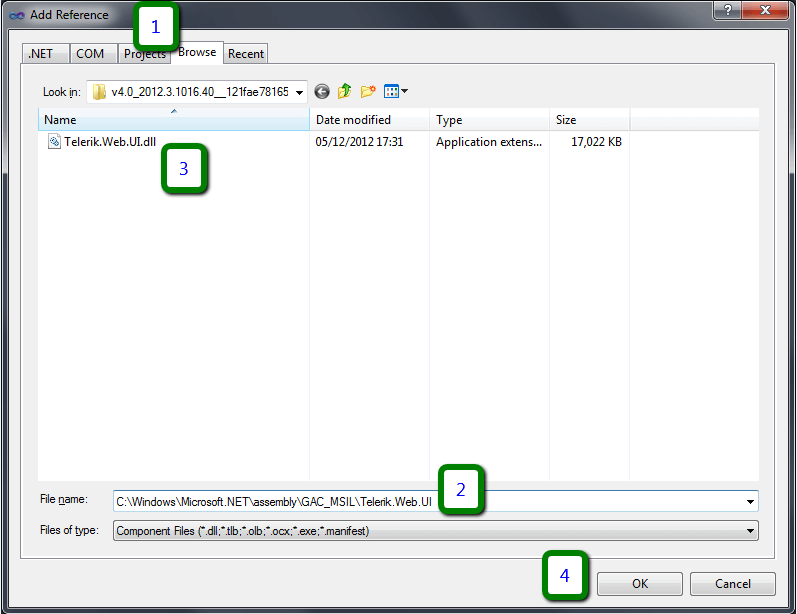 You can read more on the subject in the How to Uninstall an Assembly from the GAC MSDN article. If an assembly has been added to the GAC by an automated installer, to remove it from the GAC, you must first uninstall the program that added it. The Telerik® UI for ASP.NET AJAX installer adds the Telerik.Web.UI.Design.dll assembly to the GAC in versions prior to R1 2018. An alternative to the GUI approach below, you can simply add a few lines to theweb.config, as shown in the How GAC References Look section. Figure 3: Open the Property Pages and add a reference. Figure 4: Browse to the GAC and select an assembly to reference. 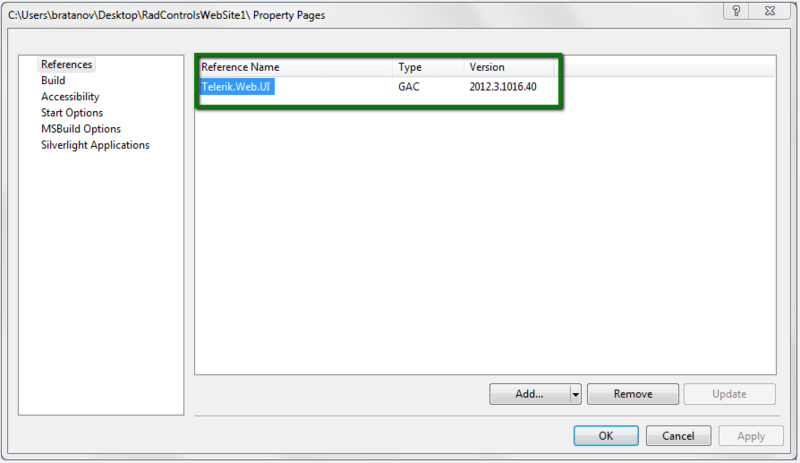 Figure 5: Examine the references and close the Property Pages dialog. Figure 6: Open the Add Reference dialog. Figure 7: Browse to the GAC and select an assembly to reference. Figure 8: Examine the references. The first problem you may encounter is that the .NET tab of the Add Reference dialog box in VS will not show custom assemblies you have added to the GAC, you either need a third party plugin for your IDE, or a registry key so that it can know about this third-party assembly. Manually browsing to the desired folder is an easy resolution. 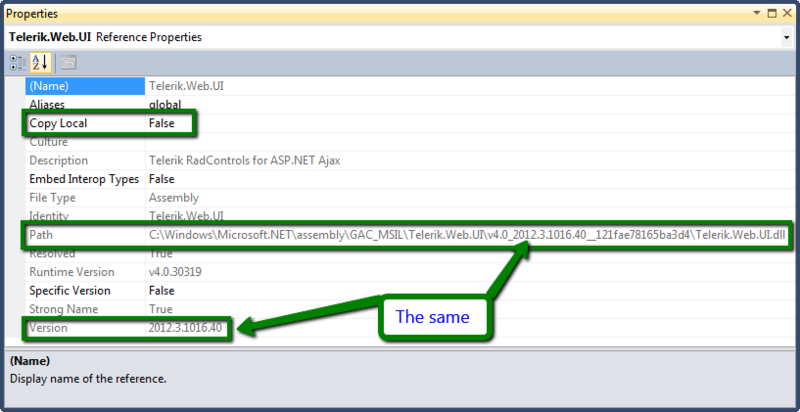 Make sure to always reference the same versions of all Telerik assemblies used in the project. If you get the "Could not load file or assembly…" error. It means the reference is typed in wrongly or the assembly is not actually in the GAC of the machine. This can also be caused by wrong version numbers (e.g. Register directives left over in old user controls). You can consider using a bindingRedirect element to redirect all old references to the current one you need. This is useful for SharePoint and Sitefinity scenarios. "CS0433: The type <RadControl class> exists in both <assembly in the GAC> and <Temporary ASP.NET Files for the site>" —this means there is a duplicate reference to our assembly – one that points to the GAC and one that points to a file somewhere else on the machine. To fix this, makes sure the project references are correct and clear the ASP cache.